This was initially going to be a monster post, but I'm still struggling to organize it all! The things uncovered at every turn last week and continuing through this one are astounding, and the hypocrisy of those touting this as some "smoking gun" of great importance is seemingly boundless. This was all still swirling in my head when I went on Angelo Coppola's Latest in Paleo podcast ... in retrospect not a good idea when I'm wound up! The crux of the matter is that a half century ago the Sugar Research Foundation paid three scientists a combined sum of ~$50K (2016 USD) to write a review article in the NEJM. This fact was not disclosed at the time. We are led to believe that this is why, all these decades later, the US Government recommends we get at least half our calories from sugar. What? No? Not true? You'd think that were the case to listen to those who went bonkers over this! At this point I have an almost visceral reaction whenever anyone starts in on that whole "everything we were told was wrong because Ancel Keys" thing because it's just too much. As corrupt as anyone thinks science, industry, academics/peer review, the media, and government could possibly be, this scenario just doesn't hold water. In the 1950s, disproportionately high rates of coronary heart disease (CHD) mortality in American men led to studies of the role of dietary factors, including cholesterol, phytosterols, excessive calories, amino acids, fats, carbohydrates, vitamins, and minerals in influencing CHD risk. (1) By the 1960s, 2 prominent physiologists were championing divergent causal hypotheses of CHD (2,3) : John Yudkin identified added sugars as the primary agent, while Ancel Keys identified total fat, saturated fat, and dietary cholesterol. Kevin Klatt at Nutrevolve wrote an excellent article in response to the article and the ensuing flurry of "gotchas": JAMA Internal Medicine - Sugar Industry. He covers a lot of ground and links to previous posts on the topic. I implore you to read it! Bravo Kevin!! I'll try not to rehash too much of his work. If I may be so bold as to condense out one key take-away, it is that this is much ado about nothing. Such specifics of disclosure were not required at the time, and the funding and documents do not appear to be the sort of smoking gun they are being made out to be. 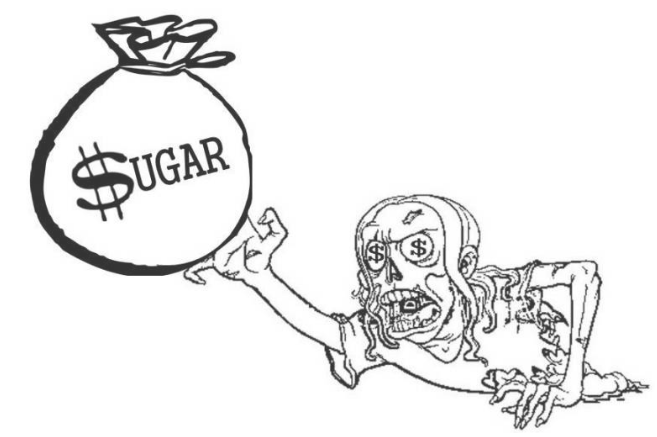 Adele Hite at Eathropology writes an excellent article as well: Sugar and Spite: Mark Hegsted and the Great Sugar Conspiracy . I didn't think it was going to be when I saw her graphic and read the first paragraph or two, but read it all the way through. As it turns out, in 1977 there were two versions of the Dietary Goals, and under Hegsted's watch the restriction on sugar was elevated in importance! Does this sound like someone who was bought off? 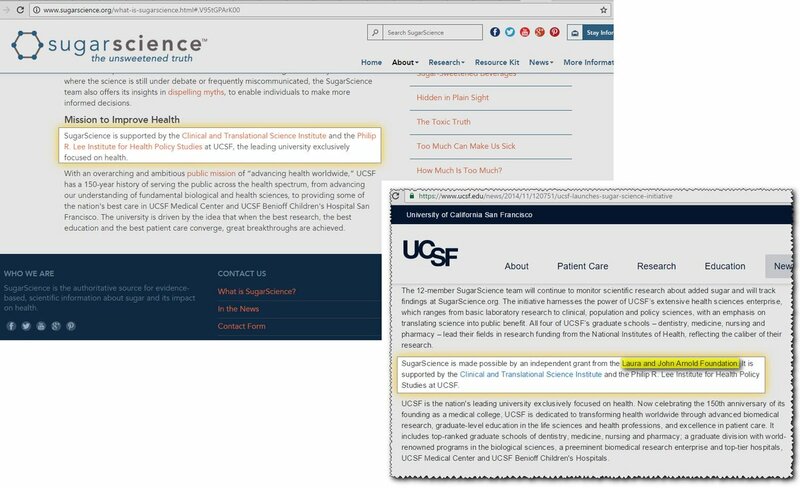 Imagine my surprise when I went looking to find that indeed, the Laura & John Arnold Foundation is the sole funding for UCSF affiliated Sugar Science. You won't find this disclosed in any such transparent manner (more on this in Part II). There is Cristin E. Kearns and Laura A. Schmidt ... and Robert Lustig. No conflicts of interest to disclose you say? I have quite a bit more on this front! I have written a lot of content on nutrition science history and various conflicts of interest. Most of this post will focus on the rank hypocrisy of those trying to portray this as some sort of unique, nutritional time continuum bending scandal. The two posts of most relevance are linked below, and if you're newer to the blog, they will provide a lot of background. Revisiting NuSI, Its Funding by The Laura and John Arnold Foundation, and Its Mission (Oct. 2015) If you do nothing else, watch the video below in light of the fact that Attia just walked away from NuSI, and NuSI was nowhere to be found touting the results of the first funded study(Hall) published recently. Meet our President | Nutrition Science Initiative from Nutrition Science Initiative on Vimeo. Nina Teicholz, The BMJ, The Nutrition Coalition and nutrition science's George Soros: The Laura and John Arnold Foundation (Oct. 2015) In the end, it turns out LJAF paid the BMJ directly to commission Teicholz to write an article. The Nutrition Coalition unveiled after their assault on Capitol Hill has scrubbed Teicholz from its website, and you'd hardly recognize it as the same group. The behavior here is not even in the same ball park of the worst offenses alleged against Hegsted. If industry funding in furtherance of their interests is to be scrutinized, as it should be, industry funding and private funding of studies aimed to undermine that same industry ought to be equally scrutinized. Disclosure of bias and funding is more critical here.